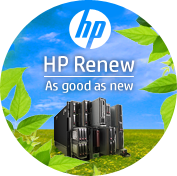 Discover HP Renew - affordable, remanufactured products that are as good as new. There is a lot of press given these days to recycling products to avoid environmental impact. A positive way to reduce the impact of products that are no longer being utilised but are in perfectly good condition, is to remanufacture them. HP offers such products through the HP Renew program. HP Renew products are not to be confused with "used" products. Instead they are high quality products that are completely remanufactured by HP. HP Renew offers an extensive portfolio of returned equipment that has been completely remanufactured by HP. All HP Renew products are Factory-Certified to be as good as new with performance equal to new. We even return it to its same-as-new warranty status. The benefit: Factory-Certified HP technology with a lower cost and performance equal to new. All HP Renew products are backed by the full original HP warranty. At HP, a remanufactured solution is offered on just about all product lines from printers to business PCs to high end enterprise products. These are products that have been returned to HP for a variety of reasons and then put through a rigorous remanufacturing and testing process to bring them back to "same as new" in terms of condition and performance. What is the difference between HP Renew products and other remanufactured or refurbished products? The distinction between HP Renew products and other remanufactured or refurbished equipment is not always obvious. HP Renew products are fully backed by HP, and have been remanufactured to be equivalent to new product standards. They carry the same warranty and service options as new HP products. On the other hand, refurbished or used equipment not purchased from HP or HP resellers is generally not fully tested and or certified to meet like-new standards. It is unlikely that these products would be backed by the full manufacturer's warranty. Purchasing a remanufactured product from HP Renew offers the same peace of mind provided with a new product with a discount that is at least 15% off the equivalent new product price. How are HP Renew products remanufactured? Remanufactured HP Renew products undergo a rigorous process to completely restore them to their original factory condition and performance. Every enterprise product in the HP Renew portfolio is thoroughly tested to ensure that it meets the same stringent standards as new products, and once verified, the HP Renew are backed by the full original HP warranty. In addition, service and support options are equivalent to that offered with new HP products and the most current software revisions are also installed. When are HP Renew remanufactured products better? What should I look for when I buy remanufactured products? Buy directly from the manufacturer - Be sure your product has been remanufactured by the original manufacturer. Brokers looking to recoup losses may refurbish a product cheaply and resell it without an adequate warranty or return policy. Buying directly from an authorised HP dealer ensures that your product has been remanufactured and tested to meet stringent HP standards. Check the warranty - Does your seller guarantee the quality of its remanufactured products? Remanufactured enterprise products in the HP Renew portfolio are covered by the full original HP warranty, which is equivalent to that offered with new products. Ask about return policies - If for any reason, you are unsatisfied with your remanufactured product, HP provides a no questions asked return policy. Check the software, service, and support options - Can the equipment be added to your service contract? Is the software legally licensed? Will the products come with the latest firmware and most current software revisions? Service and support options for HP Renew remanufactured enterprise products are equivalent to those offered with new HP products and the most current software revisions and firmware upgrades are installed.